To extend the Zourman Drums offerings, we are now turning our attention to a custom sound library of samples for 2box. With the 2box open sound source approach for sampled sounds, we were able to create a sample package based on a great snare and release it in 2box file format – DSND! Our samples are the result of a joint venture project with Jouni Niemi, owner of Big Jambo Studios, who has been a part of the 2box family since 2009 when he designed many of the factory sounds found in the DrumIt Five module. Together, we aimed to create the best snare samples in the world! Historical Background: Ludwig Black Beauty Snare 1920s. This 14×6.5″ Super-Ludwig Deluxe/Inspiration model is produced somewhere between 1924-1930. A couple of signs indicates that this legendary snare was a preproduction to a special artist. The series was called Black Beauty because of the black shell finnish (often with engravings). 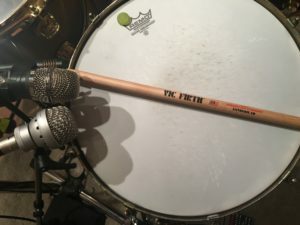 Jouni bought the 14×6.5″ snare from the legendary drumshop Pro DrumShop at Vine Street in Hollywood in 2009 for a fortune. According to Pro DrumShop, the snare had been left by the owner to be sold on consignment. The owner who left it was the legendary Drum Doctor, Ross Garfield. Ross is a well-known drum technician and supplier of drum equipment for some of the best-known bands in the world. We can only speculate where this rare snare was been used when Ross owned it and during the time since 1924. What we do know is that this snare showed up in Sweden and at Big Jambo Studios! This DrumIt Five sample pack includes a couple of different ‘flavours’ of the snare. All sample files are packed in zip format. You will need to unzip them before you load the DSND files into the DrumIt Five module. the complete description about the snare, sound, installation and knowledge! Jump to the Zourman Drums Online store here and read about our products.